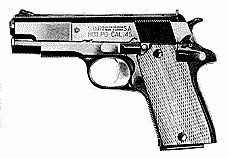 This is an exceptionally small and light .45 ACP caliber pistol. It is basically a model P, but has the mechanics of a model B, including the lack of grip safety again. It has an alloy frame and the slide is slightly relieved on the sides over the front third. Due to the short and light slide and light frame, recoil and muzzle rise is significant, but the gun is not actually uncomfortable to fire for short times and can be controlled. At the time of its introduction, this was something of an innovation, a large-bore pistol small and light enough to be carried every day, concealed if need be. Despite having been out of production for over a decade, a number are still in use for everyday concealed carry and it is still a remarkable small and light package for a .45 caliber pistol.